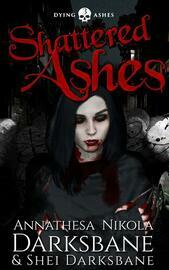 Ashes went through Hell and back to rescue the woman she loved from villains aplenty. It’s been a couple years, and her relationship with Lori is finally starting to feel normal again. So when a bit of foul vampire business starts to heat up, Ashes does everything she can to help her friends and safeguard her city without causing her traumatized lover any further stress. But when a demon of the past shows up in Birmingham, it’s all Ashes can do to keep her friends and herself from ending up six feet under. Can Ashes save her friends, her city, and her strained relationship all at once? Or have the stakes finally risen too high for even a Strigoi to handle? Shattered Ashes is the third novel in the Dying Ashes series, a gripping dark urban fantasy about a smart-assed dead lesbian and her undead adventures in the supernatural mixing pot of Birmingham, Alabama. If you like intense, thrilling action, witty banter, and deep character development, you'll love this series. Fans of Craig Schaefer's Daniel Faust series and Simon R. Green's Nightside will love this beautifully-written romp through the supernatural dark side of the Magic City.